The organ has a total of 247 pipes. 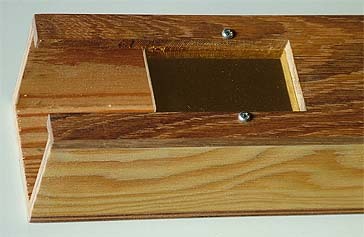 Mostly in wood, but 25 counter melody clarinets are in brass. In the table below the MIDI columns 'Reg' and 'Note' is the respective note numbers used for control. 'Sound' refers to what pitch is actually produced by the pipes. The counter melody pipes sound 4 octaves higher than their control codes, they are -48 semitone steps transposed in the MIDI score. The chimes note controls are transposed +29 steps. Nominal dimensions of all the pipes are tabulated at the end of this section. An initial set of stoppered basses turned out a little too meek. Having now finalized the height of the cabinet to be more than planned when I first made those pipes long ago, I made a new set, this time open pipes with the same diameters (51..71 mm, 2..3 in). Only the two lowest ones, for G (1.75 m long) and A had to be mitered. The body of them is made from 7 mm pine plywood except the front that is oak. In respect of their size I made good use of a table saw and a shoulder plane to make the long joints with grooves and tongues. Some extra work that pays off when it comes to gluing. First back and sides, with the front loosely in place to keep the sides parallel. Next round, after fine trimming the two bottom blocks are glued and, having clamped those, the front. The mouth design like shown, gives a fairly large degree of freedom in voicing. A number of loose pieces, in particular a little bar f, resting in notches in the ears e, to hold down the adjustable upper lip a with an elastic leather gasket in between. 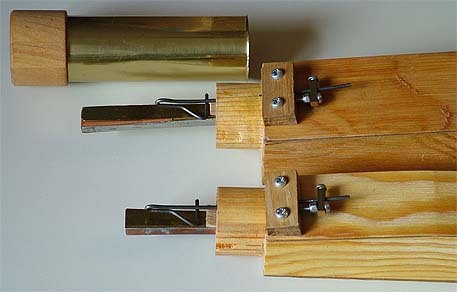 Nothing is glued here, all is held together by the slim screws through the ears into the sides of the body, plus a crosswise threaded bolt with nuts through the intonation roll d. The roll has a big hole in it to allow for fine adjustment of its position. So far I have always found the lowest point of the roll should be on the plane of the languid, the adjustment to be done is the distance to the flue jet. Perhaps the least elegant adjustment is for how the jet hits the labium - can be modified with shims between a and b unless you do some carving in b or remake a. The round hole in it is a pull-out handle, decoration, and trigger for people to ask what for. These pipes have tuning sliders at their top end, somewhat more elaborate than with the smaller pipes. They are made from brass sheet. Inside the pipe, each side of the tuning slot, is an oak stick with a threaded hole, held by a locking screw. Tightening these screws presses the slider firmly against the inside of the pipe front. Four of these eight pipes are equipped with detuners, such that the rank implements a fully chromatic octave. These are the lowest bass pipes, cylindrical 'bass clarinets', one quarter wavelength. Also this rank replaces an initial one, namely conical trombones. These clarinets are somewhat longer than the trombones, but they speak one octave lower. Since the boot has a rather small volume it is fitted with a spring loaded diaphragm to make a 'schwimmer'. This acts to reduce the AC pressure variations inside the boot and is good to ease voicing and to stabilize reed oscillation. 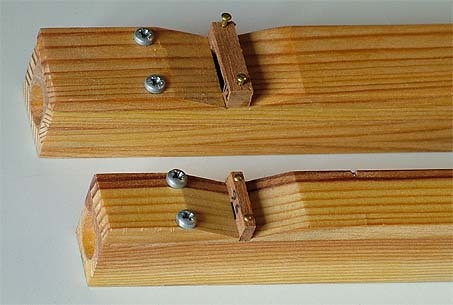 The boots of these pipes have little flags, strips of motor cloth, fixed with screws at the top ends, and marked with white dots at the low free ends. Behind each flag is a small hole such that when the pipe is blown the flag swings out to visualize that the pipe is on. The shallots are made from copper pipe, slotted and with a brass cover plate soldered on. This plate has a hole extending under part of the tongue and is covered with glued on pouch leather. The tongues are brass,1.2 to 1.5 mm thick, held by a pair of screws threaded into the shallot plate. 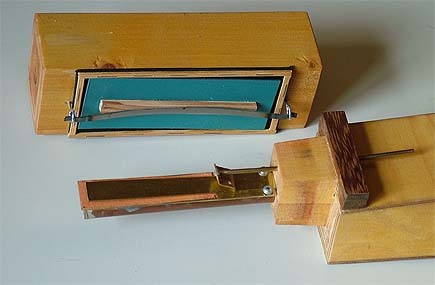 This is a set of narrow violin-type pipes that are a continuation downward from the melody violins. The design is shown at the section of the countermelody violins, register 6. These pipes form a link between the bass (reg 0) and melody (reg 10) flutes having the same scale. Bridges have been added later to allow for wider flues and more power without overblowing. On the chest this rank is placed between the cellos (reg 2) and the reeds (reg 4) such that nobody can see those ugly bridges. 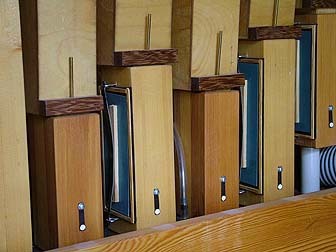 The resonators of these are a continuation upward of the bass reed pipes, speaking one octave below the other ranks on the accompaniment chest. The shallots and boots are inherited from an earlier, but discarded rank of conical pipes. The resonator front plate is bent slightly inwards in the lowest part, in order to give room for the tuning wire. The jack mechanism to adjust the tuning wires with a screwdriver is no good invention. It is rather easier to tune them the conventional way knocking the wires. Made from oak slabs, recovered from an old parquet floor. They are deeper than wide by a ratio of 4:3. This is the only rank (except the trumpets) where the cross section deviates from square. Bridges cover the entire mouth area. These features allows the airband to be quite thick without overblowing, so these pipes are comparatively loud. This rank is made identically like the melody violins, register 11. These very skinny pipes are made from recycled old fir. 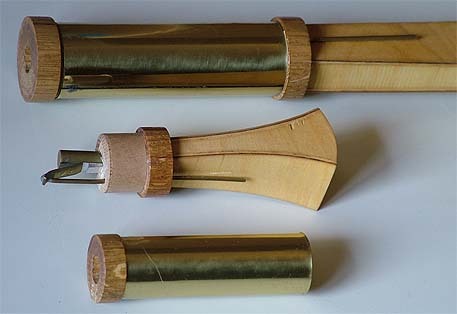 The resonators of the dozen smallest pipes are formed as a milled grooves in integral back pieces, covered by front plates, chamfered for the labium. The bigger pipes are assembled conventionally from four plates plus a bottom block. The cut up is fairly low and they are vigorously blown. To prevent overblowing the height of the bridges was carefully adjusted in the same time as the flue width was made as large as possible. The inner surface of the bridges is intuitively streamline shaped. The chamfering of the covers is essential to let air be entrained with the jet. The sound from these pipes is amazingly loud and penetrating, regarding the minute size of the openings in the mouth region. The central head piece, made from oak, has upper and lower cylindrical surfaces with offset axes. This offset gives room for the tuning wire running parallel to the tubes. The resonator tube and the boot are both plainly cylindrical. Nominal 1/4 wavelengths are quite close to the actual lengths of the resonator tubes. Diameters range from 29 to 17 mm, halving number about 24. 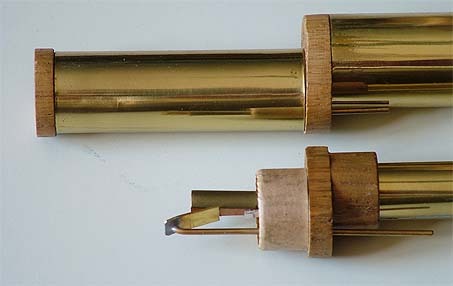 The tubes are made from standard half hard 0.2 mm brass sheet. This is much springier than pipe tin alloy, makes it difficult to shape them, but has a good tensile strength such that I can have such a thin wall and save a lot of weight. 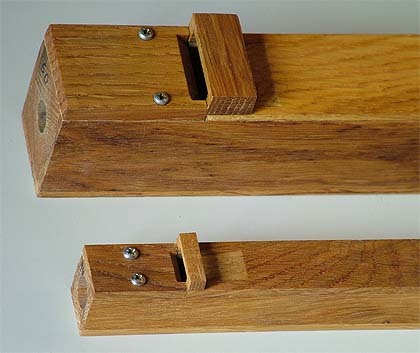 The tools to shape them was a set of cylindrical oak dowels, diameters 29, 25, 22, 19, 17, 15, 13 mm. I used only these listed diameters, about 5 pipes each size, no need to make individually interpolated diameters. This rank was built with the same basic design and measures as the open flutes below (reg 10). Because they are stoppered they however speak one octave lower, and this calls for a higher cut up, other parameters constant. For the other pipes lengths are proportional to the inverse of frequency, and diameters to the square root of that. For the shape of these resonators I arbitrarily decided on the area function A=Ao*exp(3*x2), where Ao is the throat area and x is the relative length coordinate along the horn, from 0 to 1. This is not a common exponential horn because the x argument is squared. This means the flare is moderate in the throat and much more drastic toward the mouth, an expedient to make it a little more trumpet-like. There is a factor 3 for the argument, meaning that the mouth area will be exp(3)=20 times larger than the throat area. On top of this I prescribed that both the throat and the mouth are to be squares. Mouth diameter is then about sqrt(20)=4.5 times throat diameter. This defines the relative shape of the resonators. After making a prototype I found the length of the resonators should be 0.35 wavelength. Skinniness was arbitrarily selected to L/W(69)=10 (half wavelength/mouth diameter for reference note a') and the halving number M=24. This results in horn length Lh and mouth diameter Wm for the a' pipe as shown beside. Two opposing sides of the horn are straight edge trapezoids, bent into shape. The other two are flat but with edges that are intricately curved to make up the desired area function. All sides are made from 4 mm birch plywood, made from three layers of veneer. The pieces were oriented such that the middle layer grain goes along the pipe, the visible layers across. Unless you orient them that way you cannot bend the trapezoidal sides without breaking them. To make the curved side pieces I started from this drawing (blue contours), as computed from the formula above, respecting contribution from the trapezoidal shape of the companion sides (red contours). The cross section of the horn at half its length is a quite oblong rectangle. Next step was to make copies of the drawing, one for each pipe, appropriately scaled lengthwise and cross wise. These were glued to the plywood stock, laid in two layers, and served as templates for cutting out the blanks. 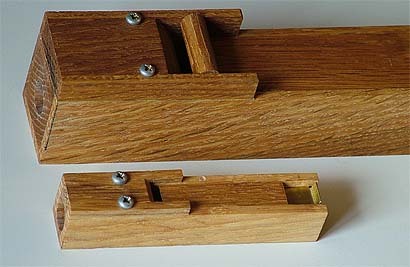 The trapezoidal pieces were made with extra width to account for the thickness of the side pieces plus a margin for trimming. Then made shoulders on their long sides with a shoulder plane, such that the remains met the required internal width measures. I took away only the innermost veneer and its glue layer, about 1.3 mm. The curved pieces were accurately trimmed. Width plus twice the shoulder depth was checked with a caliper against a big table produced with an Excel sheet. 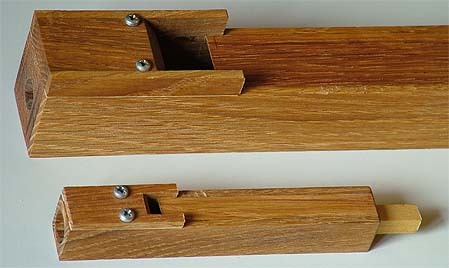 Pieces were always held pairwise together in a vise. The horns were glued with plain white glue to give enough time to adjust the pieces accurately while clamping. The positioning and clamping of the four horn pieces is critical. I found the special jig visible beside to be indispensable for the task. 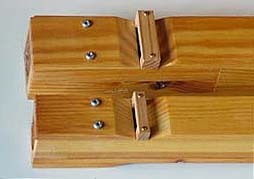 It is two square angles that are adjustably held together by screws with wing nuts. Before the gluing operation they are set to contain a rectangle matching the horn about 1/12 of its length from the mouth. When glue has been applied to the shoulders of the trapezoidal pieces you assemble the four pieces in your hand, let on the squares jig, and clamp the throat temporarily. Then you have to press the jig firmly in direction toward the mouth. Once the jig is in place you can clamp the rest of the horn easily, observing to push the side pieces all the way onto the shoulders. After trimming the outside a number of oak pieces were glued outside the throat, which was also plugged to a depth of 20 mm to later accept a hole for the shallot. The head was then shaped in the lathe. These are made from oak slabs recycled from a parquet floor. It is the first complete rank I built for this organ after exporing the subject of flue dimensioning. 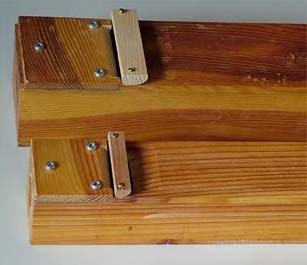 The design follows my original MMD article Recipe for Wooden Organ Flue Pipes which includes dimensioning formulas and their implementation in an Excel spreadsheet. The same design and basic dimensions was used for the stoppered pipes, reg 8. 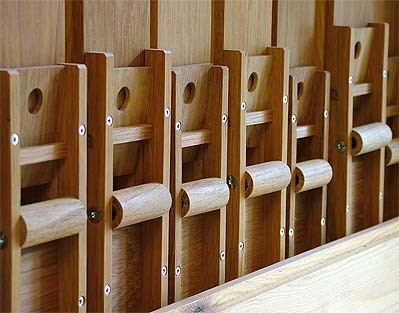 Except the highest pipes most are equipped with intonation rollers between the ears to prevent overblowing. The precise position of a roller has to be tried out during voicing operations. After cutting a small recess in the cover, the inside of the cover and the outside of the body are ground flat. One idea with this design was that it might make it easy to control the flue slit by selecting and perhaps grinding down the thickness of the gasket. Later experiences tended to show it is easier to file down the languid, so that is what I did for most of the other flue ranks. This rank is made identically like the countermelody violins, register 6, only it has five more pipes extending downward. Brass sheet details are polished with a buffing wheel and paste. Then coated with clear lacquer to avoid fingerprints which cause ugly oxidizing marks. After being glued together, but before voicing, all wooden pipes are internally sealed off with thin hot hide glue. Starting with the biggest pipe in a rank, tape over its mouth and fill it with glue for some 20 seconds, then pour the glue back into the pan. Remove the tape and let the pipe dry upside down on a newspaper. This will close pores and small voids and leave a hard and airtight interior surface. Externally pipes as well as most carpentry is painted with boiled linseed oil. The table also highlights the continuity of scaling across the different chests. For instance that the flutes of the bass, accompaniment, and melody chests essentially form a coherent principal rank. The length dimensions stated are nominal fractions of fundamental wavelength. Because of the end correction the physical length of the tuned resonators are shorter than this by about 2W for open pipes, by W for stoppered and reed pipes. The total pipe external length is greater, to include pipe foot/boot and material adjacent to the top tuning device. Note #1: Four of the bass flue pipes have detuners to enable them to generate either of two adjacent semitones. Note #2: The melody chest additionally holds a rank of stoppered pipes with the same key dimensions as its open flute rank, but thus speaking one octave lower. Note #4: The counter melody violins are identically the same design as the melody violins. Note #5: The melody trumpets are flared horns with a mouth area about 20 times larger than the throat area. The stated width W is that of the square mouth opening.